Since it won’t do to have an iPad running something called “iPhone OS,” Apple has decided to rename its mobile device operating system to simply “iOS 4,” encompassing all its mobile devices: the iPhone, the iPad, and the iPod Touch. 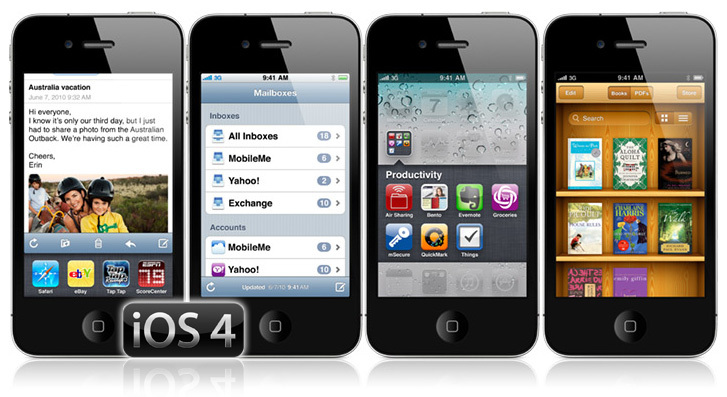 According to Apple, iOS 4 will have over 100 new features, so let’s take a look at some of the key additions that will come with the iOS 4 software update, which Apple will release June 21. This is what iPhone owners have been craving for years. Other mobile operating systems, such as Google’s Android and Palm’s WebOS, have had multitasking since day one, making this the biggest chink in the iPhone’s armor (besides Flash). Well Apple fans, it’s finally here, and it should greatly enhance the functionality of the iPhone. Background audio – Allows your app to play audio continuously. So customers can listen to your app while they surf the web, play games, and more. Voice over IP – Your VoIP apps can now be even better. Users can now receive VoIP calls and have conversations while using another app. Your users can even receive calls when their phones are locked in their pocket. Background location – Navigation apps can now continue to guide users who are listening to their iPods, or using other apps. iOS 4 also provides a new and battery efficient way to monitor location when users move between cell towers. This is a great way for your social networking apps to keep track of users and their friends’ locations. Local notifications – Your app can now alert users of scheduled events and alarms in the background, no servers required. Task finishing – If your app is in mid-task when your customer leaves it, the app can now keep running to finish the task. Fast app switching – All developers should take advantage of this. This will allow users to leave your app and come right back to where they were when they left – no more having to reload the app. If you’re one of those people who downloads every free app you can find, then this feature is for you. You will now be able to organize your apps into folders with drag-and-drop simplicity. Apps are automatically organized into folders based on their App Store category, making the process as streamlined as possible. You will now be able to unify all your e-mail accounts into one inbox, a great feature for those of you that have three or four different e-mail accounts. You’ll also be able to organize messages by threads and open attachments in third-party apps. First introduced on the iPad, iBooks will soon be a hand-me-down to the iPhone. The e-reader app will allow you to sync your iBooks library on all your Apple devices (iPhone, iPad and iPod) and will actually remember what place you’re at in a book when changing devices.